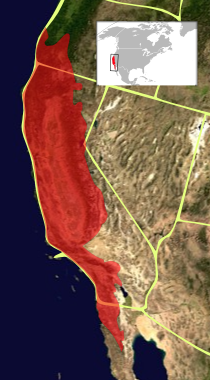 The California Floristic Province belongs to the Madrean Region of the Holarctic (or Boreal) Floristic Kingdom. As part of the Madrean Region, it is bordered on its east by the Great Basin Floristic Province, and to the south and southwest by the Sonoran Province (which includes the Mojave, Colorado, Sonoran, and Baja California Deserts). To the north, the region is bordered by the Vancouverian Province of the Rocky Mountain Region, and much of coastal and mountain Northern California and southwestern Oregon are defined as falling into either province depending on a given author's delimitations. In Baja California, the province includes the forest and chaparral belts of the Sierra Juarez and the Sierra San Pedro Martir (but excluding their desert slopes to the east), coastal areas south to about El Rosario, and Guadalupe Island. In Nevada, the CFP includes the region of the Sierra in the vicinity of Lake Tahoe, with the eastern border with the Great Basin corresponding roughly to the location of Reno-Carson City. The Great Central Valley is also within the CFP. Numerous plant communities exist in California and botanists have attempted to structure them into identifiable vegetation types groupings. Robert Ornduff and colleagues Phyllis M. Faber and Todd Keeler-Wolf did much work on this problem, and in the 2003 Natural History Guide Introduction to California Plant Life[ citation needed] established a cohesive set of titles to identify California plant communities based on but somewhat different from those earlier established by California botanist Philip A. Munz. Broken into three large groupings based on geography, the Ornduff scheme includes[ citation needed]: the Cismontane ("this side of the mountain") west of the Sierra Nevada or San Jacinto Mountains, or North of the Transverse Ranges, Montane, and Transmontane ("the other side of the mountain"), in the rainshadow of these ranges, typically desert. The hotspot presents a higher level of endemism in plants than in animals. Of the 7,031 vascular plants (species, subspecies or varieties) found in the hotspot, 2,153 taxa (in 25 genera) are endemic, meaning they are found nowhere else. About 80,000 km², or 24.7% of the original vegetation remains in relatively pristine conditions today. The province notably has giant sequoia forests, California oak woodlands (all native oaks in this ecosystem are endemic, with the exception of Quercus garryana which ranges into southwestern British Columbia) and redwood forests. Other ecosystems include sagebrush steppes, prickly pear shrublands, coastal sage scrub, chaparral, juniper-pine woodland, upper montane-subalpine forests, alpine forests, riparian forests, cypress forests, mixed evergreen forests, and Douglas fir forests, coastal dunes, mudflats and salt marshes. ^ "Conservation International". Conservation.org. Retrieved 5 December 2012. ^ Burge, D. O. et al. Plant diversity and endemism in the California Floristic Province. Madroño, 63:3-206. ^ Thorne, Robert F. Phytogeography of North America North of Mexico Archived 2004-03-17 at the Wayback Machine. Flora of North America, Vol. 1, Ch. 6. ^ a b c "HOTSPOT:California on the Edge". Calacademy.org. Archived from the original on 2012-12-02. Retrieved 5 December 2012. ^ "Tree Removal Melbourne - Tree Surgery Melbourne - Professional Tree Care Services". Tree-care.com.au. Retrieved 15 October 2017. ^ Tree Removal. Tree, Seed and Land Co. 2014. Retrieved 2 April 2014. ^ Hickman, J.C. (Ed. ), 1993. The Jepson Manual, Higher Plants of California. University of California Press. Appendix I, Pg. 1315.